Washi, being made from the gampi tree, bamboo, or even hemp, is a traditional and sustainable building material. It is also very easy to work with; all you need to install it is rice glue and an X-acto knife. To make it, the plant fibers are harvested and the thin paper is formed in a manner similar to writing paper except that fewer chemicals are used in the process. This construction paper looks more like cloth than paper at first glance. One reason it makes such a good choice for woodworking projects is the diverse and unique fiber patterns available. Like high-quality leather and snowflakes, no two specimens are the same. 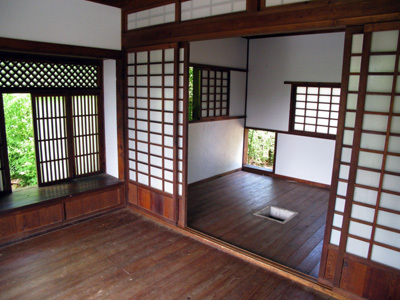 One reason the Japanese use it on wall partitions is that its structure allows light to diffuse through it, yet at the same time remaining sufficiently opaque enough to offer plenty of privacy. These is a characteristic of Japanese culture offering virtual privacy in a heavily populated society. Washi can be applied anywhere you would normally use a veneer plywood. When working with washi, it is important to remember that unlike plywood, there is really no structural component. With this in mind, a bit of prudence is in order in homes where the children are wild or where there are cats that enjoy scratching. Cabinet doors are good candidates for papering. In most cases you can keep the frames and change out the backing or apply the paper to it. Lamp shades are great candidates as well. The light will diffuse through it and add a great accent in any room. Try it on table lamps, standing lamps, and pendant lights. 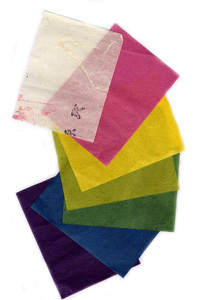 In any case, the light source will highlight the paper fiber texture and color, and there are many colors available. Interior window shutters as well as plantation shutters are perfect applications. Finally, it can be used as a form of marquetry, where different pieces of paper are cut out and adhered to an existing paper panel to create a landscape or geometric design. Picture frames offer many opportunities. Washi can be used as the matting or as part of the matting. It can also be used as an inlay. For a flush fit, your router or dado stack will have to be set very shallow. As you might suspect, this is a deceptively simple procedure. The same store that sells rolls of the paper will also sell you the traditional rice glue thats employed to apply it to your woodwork. Just lay down a flat bead of glue on the surfaces to be adhered to and apply the properly cut-to-size paper. Smooth the paper onto the glue bead and allow it to dry. This is step number one of the installation. After it has dried, it is now time to size it. Do this by spritzing it with plain water (preferably filtered) in a spray bottle. Yes, the paper will wilt and slump as it absorbs the water. But as soon as it dries, it will take up all the slack and conform perfectly to the space it is stretched across.